William L Maynard was born on 20 January 1816 in the St George, Hanover Square, London. He was the second son of William Maynard and Mary née Lawrence. On William Jnr's marriage certificate it stated that his father William was a gentleman. On 21 March 1844 William married Hannah Hawkins Way, daughter of William Way and Elizabeth née Hawkins, in the parish churches St George, Hanover Square. At the time of his marriage William was described as a baker in North Audley Street, Westminster. By 1845 William and Hannah had moved to Yeovil where their daughter Elisabeth was born and in the 1851 census the family is shown living in Rotten Row (now Market Street). William described his occupation as 'baker employing one man' and living with them were two of Hannah's sisters; Mary Bernard aged 29 an annuitant and Elizabeth Way aged 19 and a milliner. There was also one domestic servant. Despite being a baker, it appears from the poem reproduced below, that in 1858 William was producing the sausages for which he would gain some notoriety. In 1861 the family was still living in Rotten Row but now in addition to daughter Elisabeth they had a son William aged eight and a daughter Lucy aged four. William described his occupation as 'baker employing one man 'and his employee, James Priddle an 18-year-old journeyman baker lived with the family, as did their house servant. By 1865 William Maynard had moved his established, family run business making pastries and confectionery to the Borough (technically High Street) on the corner of Wine Street, as seen in the photograph below, in a baker's shop formerly run for a few years by Charles Pyne. Before that it had been a beerhouse run by William Baker who had previously been the landlord of the King's Arms in Back Kingston. 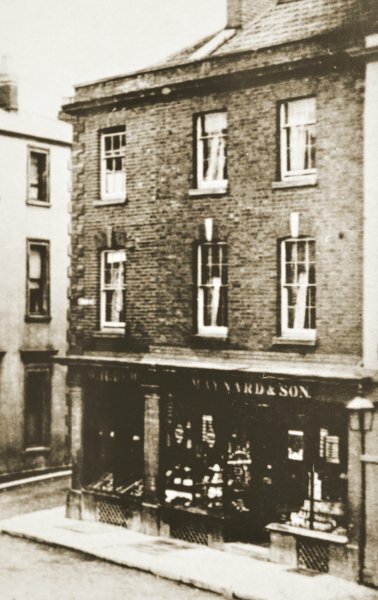 By the time of the photograph below Maynard had extended his premises by absorbing the old ironmongery shop of Josiah Hannam on the corner of Tabernacle Lane and creating one large, three-storey establishment that stretched from Wine Street to Tabernacle Lane. In the 1871 census William, Hannah and Elizabeth were listed at their address in the Borough. Also living with them was his aunt, a boarder, a live-in assistant in his shop and three domestic servants. By the time of the 1881 census William was aged 65 and was living at his home in The Park with Hannah, daughter Lucy and a domestic servant. William described his occupation as confectioner and a note on the census form records that he was deaf. Also by this time his son, also William Maynard, was helping to run the business. 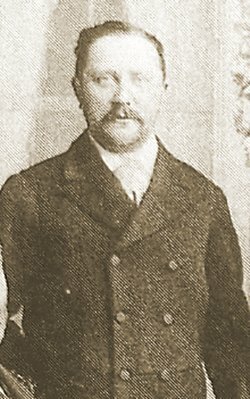 William junior was born in Yeovil in 1853 and in the 1881 census the 28-year old William described his occupation as "Confectioner, Sausage Maker and Wine & Spirit Merchant employing 2 men and 2 boys". Living with him on the premises were his 23-year old wife Emma and their baby daughter Hannah who was less than a month old. Also living there was William's sausage maker uncle William Way, a shop assistant, a young bake-house boy, a nurse for baby Hannah and two general domestic servants. 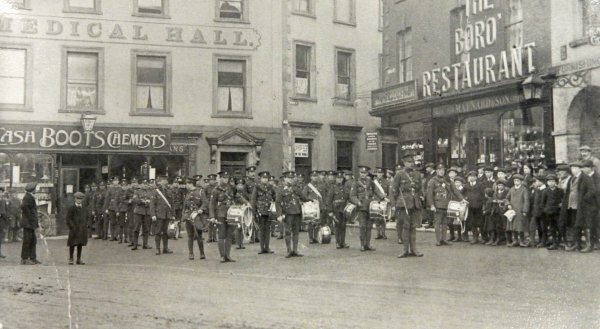 For a whole generation of Yeovilians the junction of Wine Street and the Borough was known as Maynard's Corner. 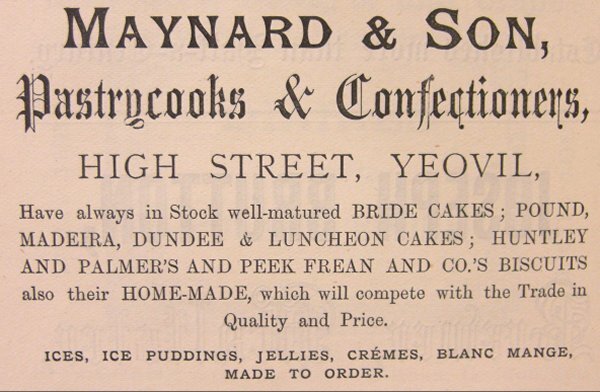 By the time of Queen Victoria’s Golden Jubilee in 1887 the business, now called Maynard & Son, was large enough to provide a celebratory lunch for the people of Yeovil. William Lawrence Maynard died in Yeovil on 28 July 1890 at his home in The Park. In the 1891 census William junior described his occupation as 'Confectioner & Wine Merchant (Master)'. He was living above the shop premises with Emma and four of their children, a confectioner's shopwoman, a cook and a nursemaid. The photograph above of William, a Deacon in the Baptist church in South Street, was taken in 1892. The Restaurant, 14, High Street, and 14, Wine Street. Whoever has read the description given by Mr Vickery of the condition of the "Borough" in the past century, and compares it with the smart, beautifully kept High Street of to-day, cannot fail to appreciate the enterprise which has animated both the private citizens and the public authorities. 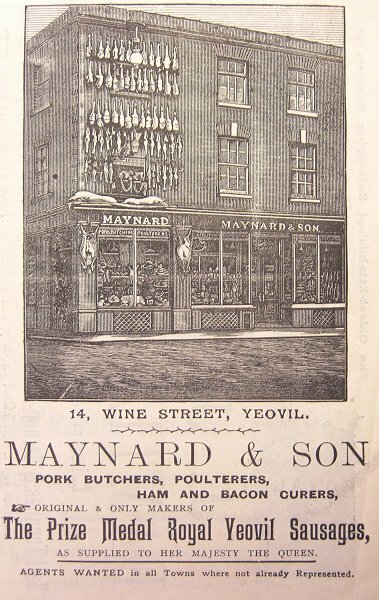 In no part of the country will you find handsomer or better arranged shops; and among the most attractive of these, and one that strikes the eye at once on entering the centre of the "Borough" from Silver Street, Wine Street, or Middle Street, is the double-fronted Restaurant of Messrs Maynard and Son. This handsome shop is, in its internal arrangement, as attractive as it is externally, and is admirably adapted for the maintenance of a leading modern confectionery trade. The shop is neatly arranged, and contains a superior stock of cakes and general confectionery, while the spacious dining rooms are completely furnished throughout, and are shown off to additional advantage after nightfall by powerful electric light. The business has been established thirty years, and, for nearly a quarter of a century, has been in the hands of the present proprietors, and at the present time maintains a leading position. Messrs. Maynard and Son, by their enterprise, have established a large and valuable connection in Yeovil and the surrounding neighbourhood, their successful catering for balls, parties, dinners, and banquets being of a high standard of excellence. None but the purest ingredients are employed, and the staff of experienced pastry cooks enables the firm to turn out large quantities of high-class goods, and to undertake wedding, picnic, luncheon and similar orders on the shortest notice. The firm are agents for W & A Gilbey's wines and spirits, and for ales and stouts by Bass, Guinness, Allsopp, etc. The merits of the "Royal Yeovil" sausages, as supplied to Her Majesty the Queen, manufactured by Messrs. Maynard and Son, are yearly becoming more appreciated, and a very large quantity is now made to meet the demand. The firm, about twelve months since, finding the adjoining shop at the corner of Wine Street was becoming vacant, took it over, and opened a first-class pork and poultry business, where excellent pork and sausages, the best fed hams and bacon, and poultry in the primest condition, are supplied, and this subsidiary business has developed into a valuable adjunct of the Restaurant. To both branches Messrs. Maynard and Son give a constant personal supervision, and the large and permanent connection they have secured among the gentry and principal inhabitants, is the best testimony to the superior manner in which the business has been conducted. In the 1901 census William junior was listed as living at the business premises at 14 High Street with his wife Emma, daughters Hannah and Edith and son Leonard. Also living on the premises were two lady assistants in the shop, a cook and a housemaid. The advertisement illustrated below from Whitby's Yeovil Almanack Advertiser of 1897 shows that by this time the pastrycook and confectionery side of the business had been supplemented by meats and Maynard was advertising the business as pork butchers, poulterers, ham and bacon curers. 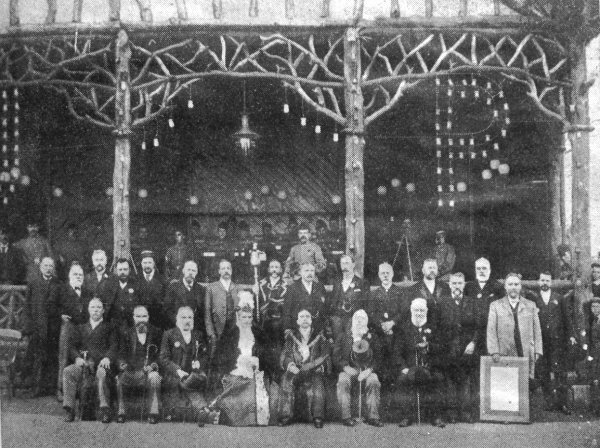 They were also proud that their "Prize Medal Royal Yeovil Sausages" were enjoyed by Queen Victoria! In 1904 Maynard, described as a caterer, made an indemnity to the Great Western Railway for an agreement for rebuilding two rooms used as receiving office. He was presumably catering at railway stations as well. 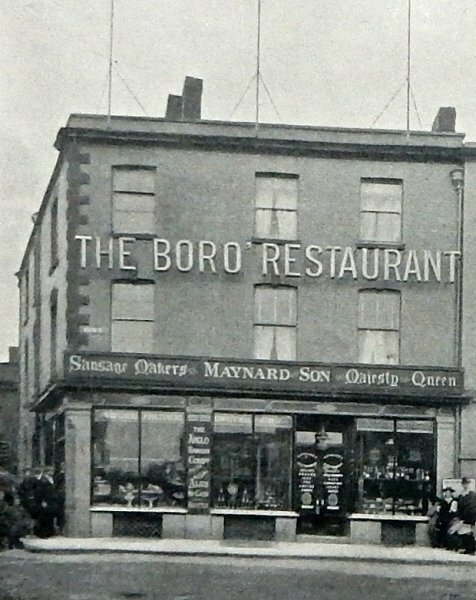 It was around this time that the upper floor of the Borough premises was converted to become the Boro' Restaurant. 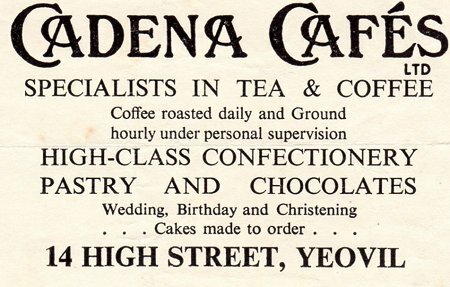 In the early 1930's the business was bought by Cadena Café Ltd who advertised it as "Yeovil's largest and nicest cafe". It certainly was and I remember having lunch in the upstairs dining rooms most Saturdays during the later 1970's, usually under the fine, oval lantern light in the ceiling. 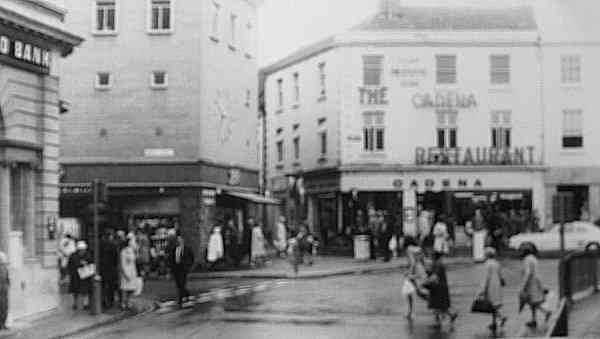 The other things that many older Yeovilians will remember was the cashier half-way up the grand staircase and, whether they were patrons or not, the fabulous smell of roasting coffee that was fan-assisted into the Borough from the Cadena. 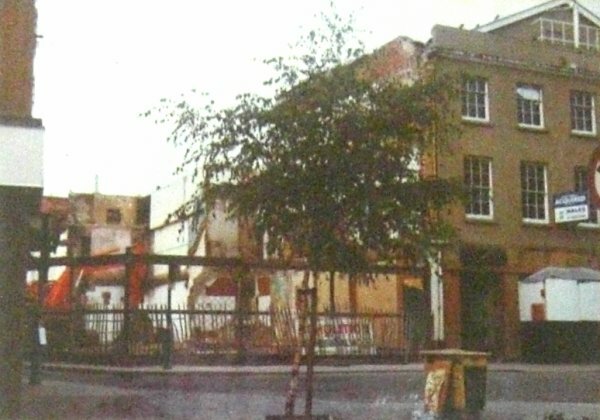 The Cadena Café closed in 1982 and the building was demolished in 1983 (see photos below), with the present building taking its place. 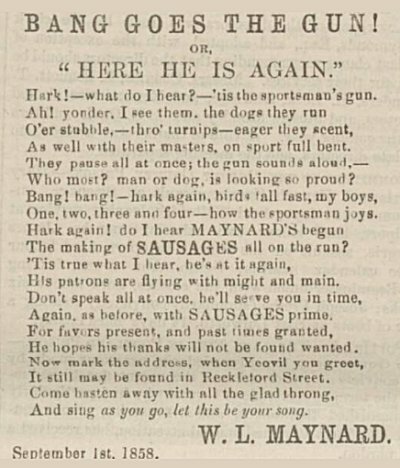 A poem used to advertise William Maynard's sausages from the 7 September 1858 edition of the Western Daily Press. Note that at this time Reckleford Street was the name of today's Market Street and was also known as Rotten Row. 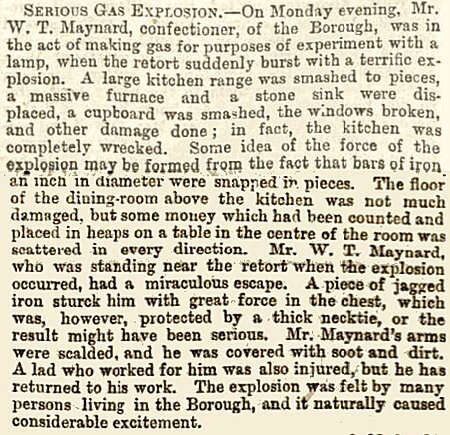 A report, from the Western gazette's edition of 1 October 1880, of an explosion from which, it seems, WT was lucky to escape with relatively minor injuries. 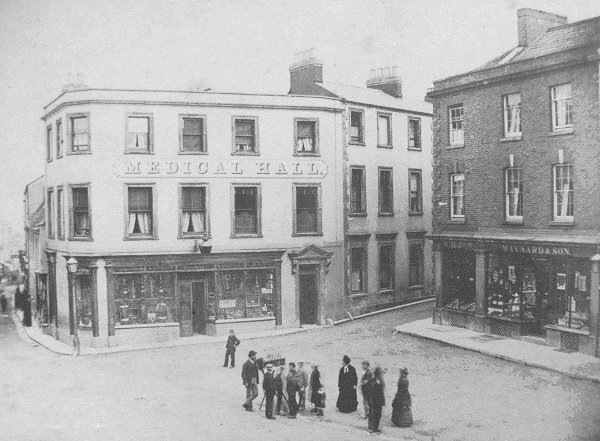 This photograph was taken in the 1890's and shows the old Medical Hall at left which was bombed in the Second World War. Right of centre is the entrance to Wine Street and at extreme right is William Maynard's shop in the Borough. Before Maynard's premises were built the site was occupied by a medieval building known as The Bow. 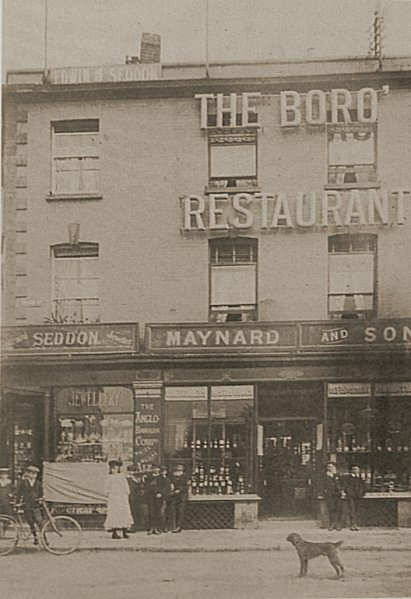 Maynard & Son's establishment, photographed in the 1890s. A Maynard & Son advertisement from Whitby's Yeovil Almanack Advertiser of 1882. I'm not sure if 'well-matured bride cakes' applied to the bride or the cakes! A Maynard & Son advertisement from Whitby's Yeovil Almanack Advertiser of 1897. By this time the pastrycook and confectionery side of the business had been supplemented by meats, presumably in that part of the shop on the corner of Wine Street festooned with dead poultry! It's nice to see that Queen Victoria enjoyed "Prize Medal Royal Yeovil Sausages". .... and did you spot the error on the advert? The business was at 14 High Street, not 14 Wine Street (which was past the Wine Vaults - don't make the same mistake as in the book "Then & Now, Yeovil" in which it is claimed there were two shops!). This photograph was taken by Yeovil Photographer Jarratt Beckett and published in his 1897 book "Somerset viewed through a Camera". Maynard & Son proudly proclaims in their shop signage that they are "Sausage Makers to Her Majesty the Queen". The decorations for the coronation of King Edward VII and Queen Alexandra in 1902. 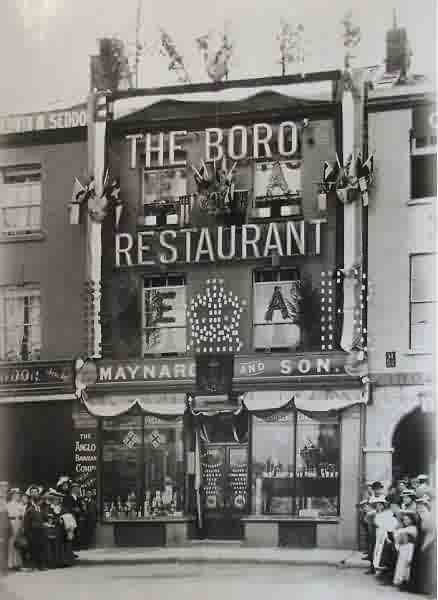 This photograph dates to about 1907 by which time Maynard had relinquished that part of his shop adjoining Wine Street. It was now occupied by Edwin Seddon, jeweler and watchmaker who installed the clock in the Western Gazette offices in 1906. 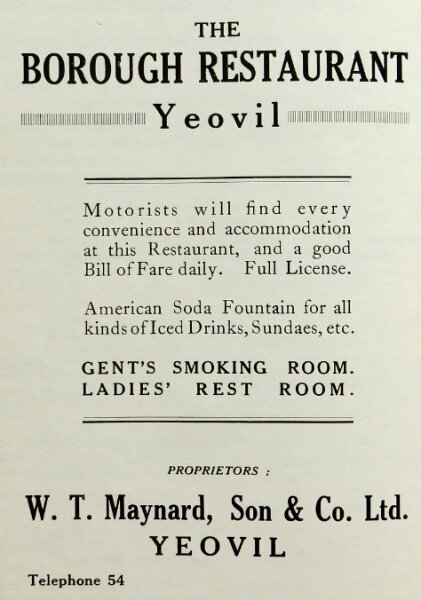 An advertisement for Maynard's Borough Restaurant in a Yeovil Guide of the late 1920s. Note the 'American Soda Fountain'. 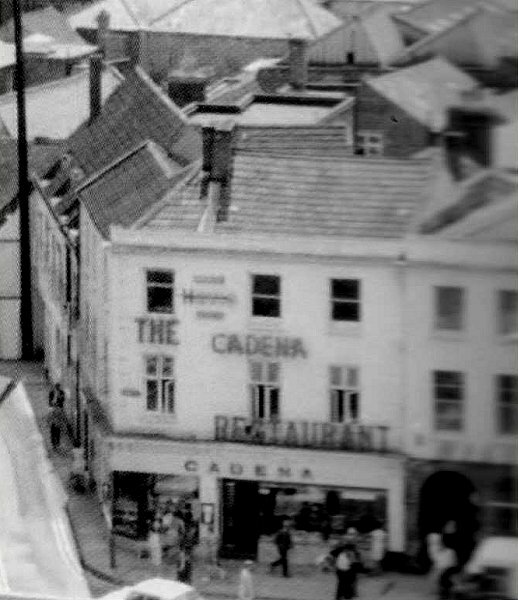 The Cadena Restaurant, photographed from the top of St John's church during the 1960s. ... and photographed from ground level in the 1970s. 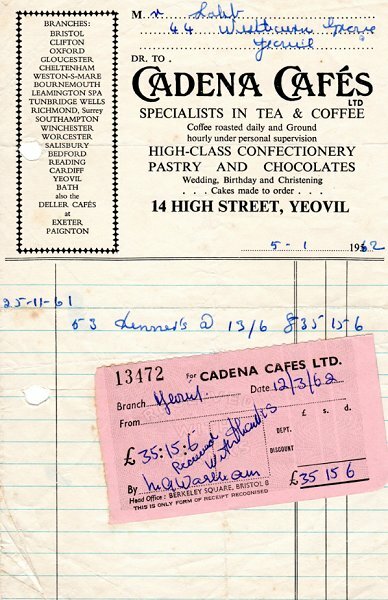 A 1962 receipt for 53 dinners at the Cadena - and before you can say "Blimey, who eats 53 dinners?" it was for an Old Yeovilians Association reunion dinner. .... and a Cadena advertisement from around the same period. 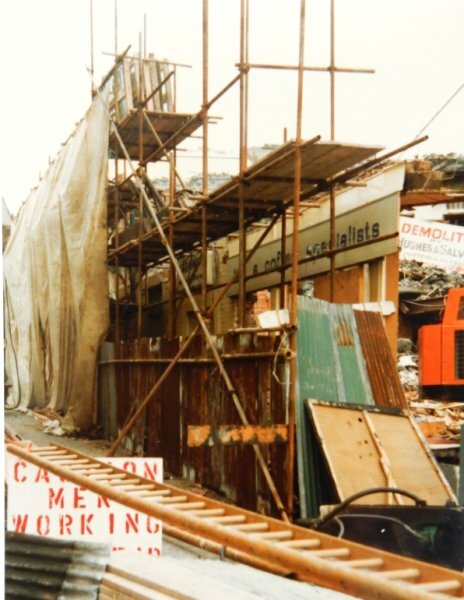 The Wine Street side of the Cadena mid-demolition in 1983. 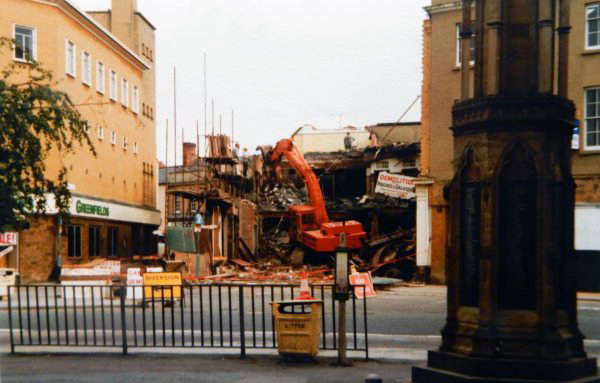 The demolition of the Cadena in 1983, photographed from the end of Middle Street. .... and seen from the Borough.